Eighty percent of the fastest growing B2B companies employ content marketing, according to data from Mattermark and Drift.com. But not all B2B marketers are seeing fast results. In fact, the Content Marketing Institute surveyed B2B marketers and found that only 34% of them believe their content marketing strategies were effective or extremely effective. The remaining 66% of B2B marketers feel their content marketing efforts are unsuccessful. If you’re among those 66 percenters, it’s okay. After all, failure is just a stepping stone on the path to success. To help you recalibrate your content strategy for high-flying results, we’ve highlighted how six B2B brands use content marketing to fuel their business and what you can learn from each one. Cisco, the worldwide leader in networking, set out in 2016 to emphasize their brand’s mission of transforming the way people work. One of the strategies they used to accomplish this was a content campaign called There’s Never Been a Better Time. In Never Better, Cisco used authentic customer stories to illustrate how they help power innovation across several industries. 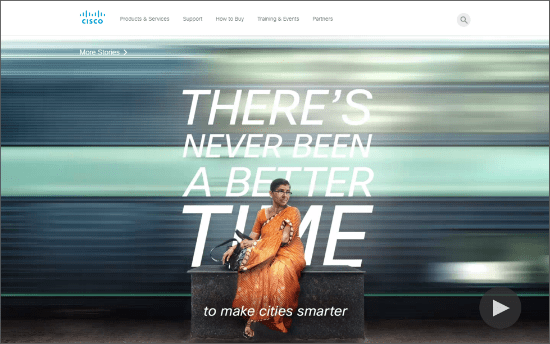 The end result was a campaign that reinforced their brand values and demonstrated to audiences that Cisco is the company that powers connections around the world. IBM is the world’s eighth largest information technology company with scores of products and services. With such a wide array of offerings, IBM undoubtedly has countless customer personas. And somehow, IBM has managed to create custom content for nearly every one of them. With custom, relevant content for each persona, IBM is able to reach each their target audiences at the right time. Furthermore, IBM structured their content and organized their blogs to serve relevant parties with carefully planned metadata. B2B Marketer Takeaway: Tailor and structure content for your target audience to attract the right people and increase conversions because personalized content delivers six times higher transactional rates. As an industry leader in all things SEO, it’s no surprise that Moz has a killer content strategy. But one of their blogs may surprise you: YouMoz, the user generated SEO and online marketing blog. 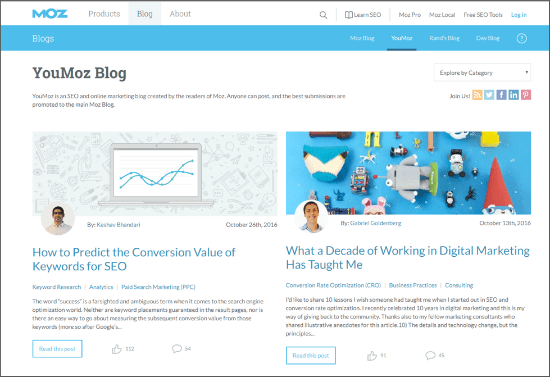 By encouraging guest posts from Moz’s end users—the SEO analysts and marketing managers of the world—Moz created a community of digital marketing experts. Fostering this community increased engagement in their brand and grew traffic to the blog. B2B Marketer Takeaway: Great content doesn’t have to come directly from you. Guest blogging and other user generated content can be a huge boost for traffic and engagement considering sites with user generated content see a 26% increase in return visitors and a 90% increase in time spent on site. MYOB, a finance management tool for both large and small businesses in Australia, focuses their content strategy around educating their clients. After all, taxes are a hard code to break. One of the most successful resources they offer is the End of the Financial Year tool, where visitors click on important dates throughout the year to receive tax time to-dos and tips. It’s an ingenious way for MYOB to demonstrate their expertise and reinforce their authority on business tax. 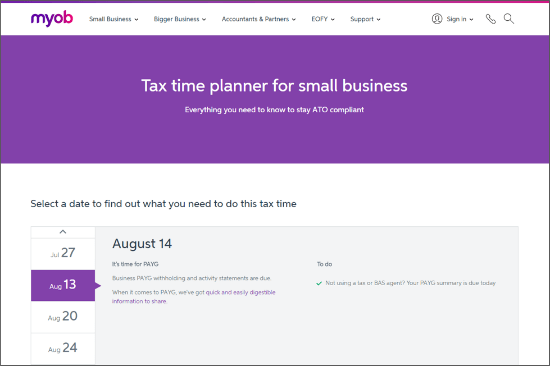 We have no doubt that many clients and prospects have bookmarked this tool in their internet browser, making MYOB their go-to resource for tax time in Australia. B2B Marketer Takeaway: Content marketing success is more than just blogging. It’s about creating useful content for your audience. 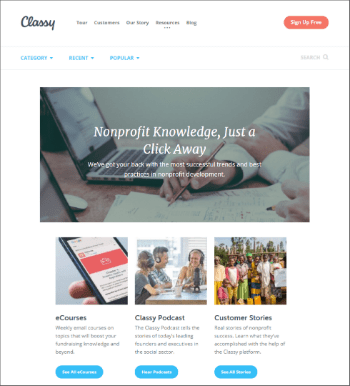 The fundraising platform, Classy, knows exactly who their client is: non-profits. But they found out early on that their growth was directly impacted by how well their clients operate. To combat this, Classy created a content strategy centered around education. Their blog and resource center is loaded with eLearning courses, guides, and webinars on nonprofit marketing, fundraising, and operation. With this strategy, Classy’s clients are raising record-high dollar amounts and driving Classy’s growth. B2B Marketer Takeaway: Help your clients become successful by educating them with guides, checklists, webinars, and more. Slack, the fastest-growing business app to date, has set their sights on becoming the #1 productivity tool for businesses across the globe. To reach such a high goal, Slack turned to content marketing to grow awareness and engage new audiences. Our favorite strategy that is helping Slack close the gap is their Work in Progress podcast. The podcast has a wide reach and was even syndicated by SiriusXM radio. With a successful podcast on their hands, Slack saw an opportunity to amplify their success and created emails, blog posts, and other slices of content to boost traffic. B2B Marketer Takeaway: Support your best content assets with complimentary pieces like social messages, blog posts, videos, and more to reach a larger audience.